Sun., Jan. 7, 2018, 8:17 p.m.
ATLANTA – To win national championships the old-school, SEC way, you must have a smothering defense packed with big plays and a strong kicking game. Most important, you must run the ball. Georgia’s running game is deeper and better than Alabama’s, by only a slight margin. That’ll be the difference in Monday night’s national championship game. In 1980, Herschel Walker’s decision to sign with Georgia laid the groundwork for a national title that year. 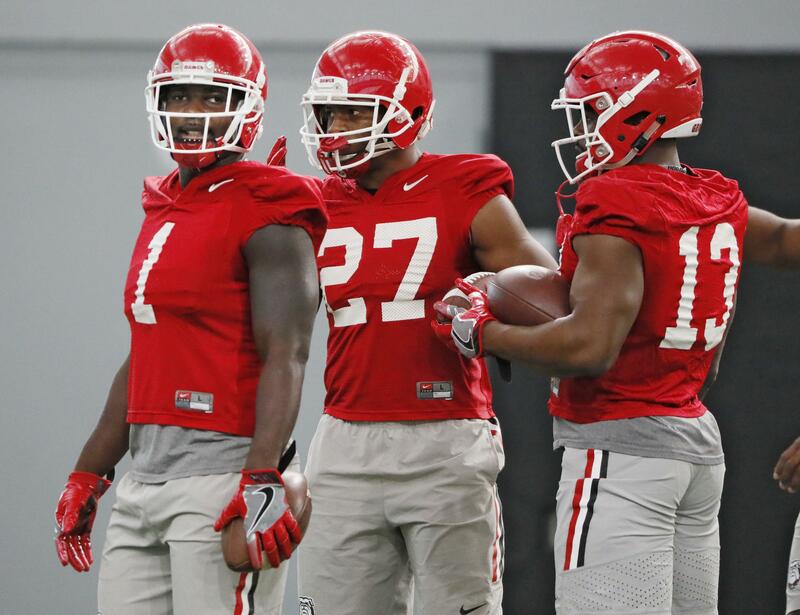 Similarly, the 2017 Bulldogs’ hopes turned on the decisions by tailbacks Nick Chubb and Sony Michel to put their NFL dreams on hold for a year and return for their senior seasons. The decisions by Chubb and Michel, as well as outside linebackers Lorenzo Carter and Davin Bellamy, all announced on the same December day in 2016, were crucial for coach Kirby Smart’s second season. Carter blocked a field goal and Michel had the winning touchdown run in the second overtime of last week’s 54-48 Rose Bowl playoff semifinal win over Oklahoma. Chubb and Michel combined to run for 326 yards against Oklahoma to become the most productive tandem in NCAA FBS history, passing SMU’s Eric Dickerson and Craig James. In 1980, Walker was a one-man running game. Chubb trails only Walker on the SEC’s career rushing list, yet he has far more help than Walker every dreamed of. Chubb and Michel each topped 1,000 yards this season – a first for Georgia – but to fully appreciate the depth of Georgia’s attack, look below the seniors on the season stats. Freshman D’Andre Swift has 603 yards rushing. Elijah Holyfield and Brian Herrien combined for 558. But this is not a one-dimensional team. Freshman quarterback Jake Fromm is far more than just a game manager. He has passed for 23 touchdowns and almost 2,400 yards and he rarely makes mistakes. Fromm won his first start at Notre Dame, immediately supporting reviews from coaches and teammates that he has unusual poise, especially for a first-year player. That poise helped him throw two touchdown passes without an interception in the Southeastern Conference championship game, and he threw two more in the Rose Bowl. Georgia’s running game creates man-to-man matchups for play-action passes, and receivers Javon Wims, Terry Godwin and Mecole Hardman have the skills to turn short passes into big gains. The defense is packed with NFL-bound talent, led by linebacker Roquan Smith. Rodrigo Blankenship has made 17 of 20 field goals, including an important 55-yarder to close the first half at the Rose Bowl. But it’s the running game that will deliver the championship. Michel ran for 181 yards and three touchdowns and Chubb added 145 yards and two touchdowns against Oklahoma. Georgia won’t match that production against Alabama. This is different. This is SEC-style championship football. “I would just say we play hard-nosed football,” Michel said. This time, the student beats the master. That hard-nosed running game – and a big day from Blankenship – will deliver a national title for Georgia and Smart against Alabama and Saban. Prediction: Georgia 26, Alabama 24. Published: Jan. 7, 2018, 8:17 p.m.